← Best sick food ever! Finally. I WILL sit down and write this blog post. The writing block surrounding this particular culinary endeavor has almost been as bad and scary and intimidating as actually making the beef wellington itself, complete with puff pastry from scratch. It is as if I don’t write a post that is commensurate with the success of the wellington, it will diminish the cooking accomplishment somehow. I need to get over that. I do not have mastery over the time-space continuum, as much as I’d like to, and the past will not be altered. 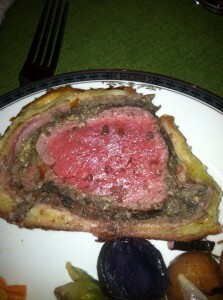 The beef wellington will remain in memory just as delicious as it was when I cooked it. NOW WRITE, CRAIG! WRITE! 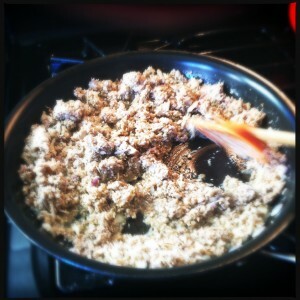 Making the duxelles. A food processor helps with this! Picture this: Thanksgiving 2012. (He says, channeling his inner Sofia Petrillo.) The “gang” is scattered to the wind with two gone on some crazy Dubai, India, Southeast Asia, Hong Kong cruise. No, I wasn’t jealous of them at all and I was not going to let my thanksgiving holiday feast plans be diminished in anyway because we were down a few bodies. In fact, those who remained were potentially more culinary adventurous folk, so we decided on something non-turkey: beef wellington. Decadent yet festive and celebratory, and I could finally attempt to master puff pastry from scratch. With that decision made, I dove deep into the internet looking at recipes for both beef wellington and puff pastry. And then proceeded to freak! The endeavor was not going to be a quick or easy process, but I was committed to it. After all, I had seen that beautiful Lorraine Pascale on her Cooking Channel show, “Simply Baking”, making puff pastry look, well…easy. So I too shall do it, despite the interrogatives from familial doubters. “Just buy it!” they said. Truth be told, I did but only as a back up in case mine was a complete failure. As a side note, the only place in town that readily sells an “all butter” frozen puff pastry dough is, get this – Trader Joe’s. Love them! The first step was to conquer the puff pastry. See my post to follow on specific instructions. It was successful and I was beside myself with joy, pride, and feelings of accomplishment, etc. I think it’s why I’m single. Food shouldn’t excite me this much. Now to move on to the beef. 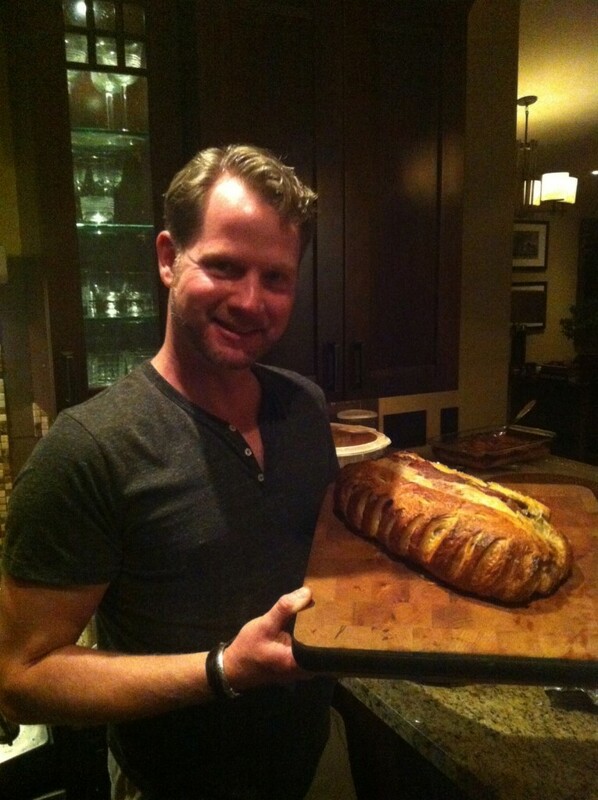 My internet reading led me to the tried and true Tyler Florence’s Ultimate Beef Wellington. 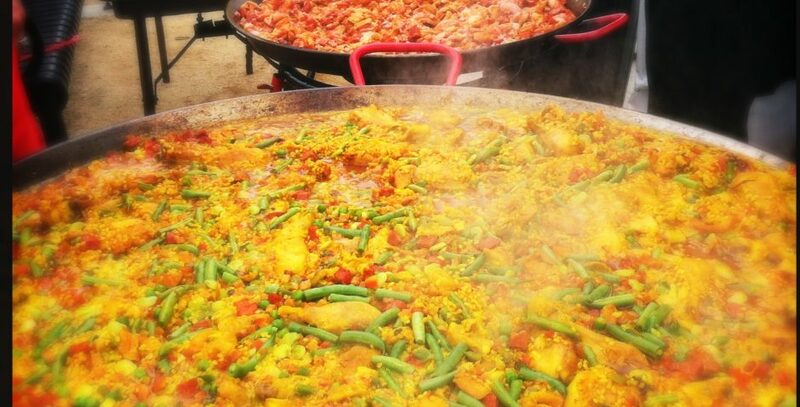 He usually is able to capture what the dish is about without making it overly complicated. Now if I could just figure out where to get a tenderloin. I put in a call to my fabulous chef friend and she knew exactly where to put in an order to get the best tenderloin – Newport Meat company. It was grass fed and all that and promised to be delicious. Thanks J! 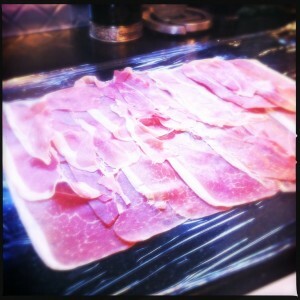 A sheet of prosciutto. Does it get any better?! With the puff pastry complete the weekend before and in the freezer, I got to work on the beef the day before the feast. First step was to trim the beef. I will admit I don’t cook a lot of red meat, so trimming was a little scary to me. I tried to take the “less is more” approach and got it down to just the bare minimum of cuts, and set the meat aside while I started on the next step – the duxelles. Fancy word, duxelle, eh? Really it is just a finely chopped mushroom, shallots, and garlic with herbs sautéed in butter and/or oil, reduced almost to a paste. It is used in all kinds of stuffings and sauces, as a garnish, or also as a filling for a pocket of raw pastry and baked as a savory tart. Where did the word come from or what does it mean? Wikipedia says, “Duxelles is said to have been created by the 17th-century French chef François Pierre La Varenne (1615–1678) and to have been named after his employer,Nicolas Chalon du Blé, marquis d’Uxelles, maréchal de France.” So it’s just some French dudes name…dang, I was hoping for more! Tyler’s recipe called for just white button mushrooms. I used a mixture of half white button and half cremini mushroons, which are sometimes sold as “baby bella” and are just young portabello mushrooms. I was hoping it’d give some extra flavor to the duxelles. The duxelle was cooked so until the majority of the moisture was out, and there is a LOT of moisture in mushrooms, and then set aside to cool. 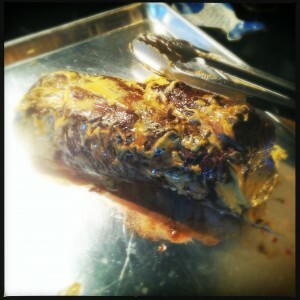 Tenderloin all wrapped up like a tootsie roll ready to chill! 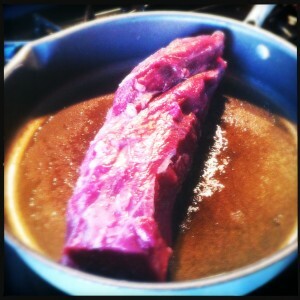 Next step: searing the tenderloin on ALL sides, including the ends…get your tongs out ladies and gentlemen! Once that is done, I smeared with a good dijon mustard. At this point, a lot of people say “EWH! I hate mustard” Hush now. That seam should have been down…doh! Don’t worry, it turned out. I did an egg wash and sprinkled it with sea salt. I put out a big rectangle of plastic wrap on the counter and mad a layer of shingled prosciutto, big enough to cover the tenderloin. You might need to sample the prosciutto if a piece gets torn. Or two pieces. Cooking is hard work! Just saying… Once that is done, I spread the room temperature duxelle out in a thin layer over the prosciutto and sprinkled fresh thyme over it. Then the tenderloin went in the middle of this to wrap it all up. Pick one end of the plastic up and roll baby roll!! Once it is covered, then ends were twisted like a tootsie roll until it was nice and tight, then set on a sheet tray in the fridge to chill out until it was ready to cook. I have to admit I was admiring my handy work already – it’ s a might good looking meat roll at this point! 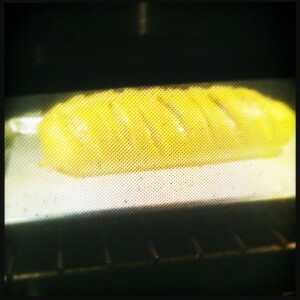 In the oven…puff pastry a puffin’! A few hours before we were ready to cook the tenderloin, I took the puff pastry out and mad sure it is thawed enough to roll out but didn’t get overly warm. 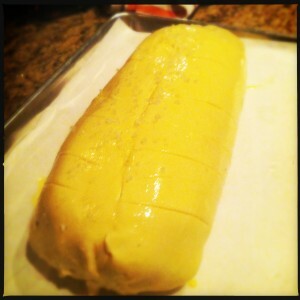 The butter will melt and the pastry will go gross if it gets warm. Having a marble or granite counter helps with this. If the counter top is too warm, put out a sheet tray with ice in it and let it sit on the counter for a while to cool it down. Words can’t describe how good this was. It cut with a fork!! together if you are having trouble. Make sure you put the seam side down when you bake it or it will split apart. After it is wrapped, the whole thing needs to chill in the fridge for another hour or so. Puff pastry should be SUPER cold when baked off or the butter just melts and runs everywhere before the dough sets and puffs up. And that’s no fun my friends. I baked the beef for about an hour a 425 deg F, checking the temperature per the recipe. If the pastry starts to brown to soon, tent it with aluminum foil. With good beef, like we had, you’ll appreciate it leaving it on the rare side. Those who don’t like rare beef can have the end pieces which cook more. I ended up taking it out around 55 minutes when it was just around 110 degrees. While the beef was baking, as if there isn’t enough to do already, I got to work on the green peppercorn sauce. I know, this cooking will never end but it is SO worth it! I couldn’t find green peppercorns already brined so I bought some dried at Penzy’s spices and brined them myself. Super easy. Vinegar, water, salt…done! Tyler’s recipe was most excellent too. The beef was set aside to rest for 10 or so minutes, covered with foil, while we put the final touches on all the delicious sides everyone brought and got the wine poured. The moment of truth came and I sliced the Beef Wellington. It looked awesome so we served it up with the green peppercorn sauce. This has to be one of my most favorite meals ever! It is not light by any stretch of the imagination so it is really a treat and indulgence. What made this meal even better was a group of unlikely characters sitting around who truly appreciated it and each other. Everyone contributed something to the day and the meal which was great. While the meal got going, we started a spontaneous round of “what I’m thankful for” and I was really moved by everyone’s answers. There was such a sense of honesty and gratefulness I really appreciated each and everyone’s sentiment. And the fabulous meal that was about to be enjoyed! So there…epic post done. Finally I can rest at night now without having to think about the beef wellington post that hasn’t been done, for months now. Enjoy! To make the Duxelles: Add mushrooms, shallots, garlic, and thyme to a food processor and pulse until finely chopped. Add butter and olive oil to a large saute pan and set over medium heat. Add the shallot and mushroom mixture and saute for 8 to 10 minutes until most of the liquid has evaporated. Season with salt and pepper and set aside to cool. To prepare the beef: Tie the tenderloin in 4 places so it holds its cylindrical shape while cooking. Drizzle with olive oil, then season with salt and pepper and sear all over, including the ends, in a hot, heavy-based skillet lightly coated with olive oil – about 2 to 3 minutes. Meanwhile set out your prosciutto on a sheet of plastic wrap (plastic needs to be about a foot and a half in length so you can wrap and tie the roast up in it) on top of your cutting board. 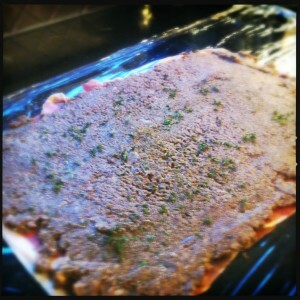 Shingle the prosciutto so it forms a rectangle that is big enough to encompass the entire filet of beef. Using a rubber spatula cover evenly with a thin layer of duxelles. Season the surface of the duxelles with salt and pepper and sprinkle with fresh thyme leaves. When the beef is seared, remove from heat, cut off twine and smear lightly all over with Dijon mustard. Allow to cool slightly, then roll up in the duxelles covered prosciutto using the plastic wrap to tie it up nice and tight. 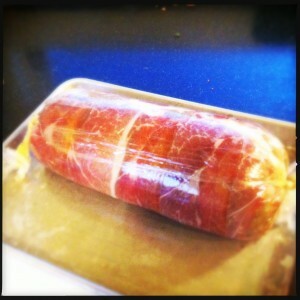 Tuck in the ends of the prosciutto as you roll to completely encompass the beef. Roll it up tightly in plastic wrap and twist the ends to seal it completely and hold it in a nice log shape. Set in the refrigerator for 30 minutes to ensure it maintains its shape. On a lightly floured surface, roll the puff pastry out to about a 1/4-inch thickness. Depending on the size of your sheets you may have to overlap 2 sheets and press them together. Remove beef from refrigerator and cut off plastic. Set the beef in the center of the pastry and fold over the longer sides, brushing with egg wash to seal. Trim ends if necessary then brush with egg wash and fold over to completely seal the beef – saving ends to use as a decoration on top if desired. Top with coarse sea salt. Place the beef seam side down on a baking sheet. Brush the top of the pastry with egg wash then make a couple of slits in the top of the pastry using the tip of a paring knife – this creates vents that will allow the steam to escape when cooking. Bake for 40 to 45 minutes until pastry is golden brown and beef registers 125 degrees F on an instant-read thermometer. Remove from oven and rest before cutting into thick slices. Garnish with minced chives, and serve with Green Peppercorn Sauce, Roasted Fingerling Potatoes, and Warm Wilted Winter Greens. Add olive oil to pan after removing beef. Add shallots, garlic, and thyme; saute for 1 to 2 minutes, then, off heat, add brandy and flambe using a long kitchen match. After flame dies down, return to the heat, add stock and reduce by about half. Strain out solids, then add 2 cups cream and mustard. Reduce by half again, then shut off heat and add green peppercorns. 2 Responses to THE Beef Wellington!! I love the pimientos fritos, but I use the cubanelle peppers. I have ten plants in the garden this year. How did your comment end up on the beef wellington post? Cubanelle’s are good. I don’t have room for 10 plants of them for sure. Lucky you! !